Find out exactly what you need to do to set up and implement an internet marketing strategy. Save time and money with our step-by-step guide to creating an internet marketing strategy. Haven't had time to think about an online marketing strategy or don't know where to begin? 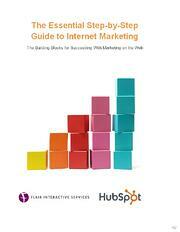 Our ebook, "The Essential Step-by-Step Guide to Internet Marketing", can help. Submit the form on the right to download the Internet Marketing ebook now.